We can stay here while we wait is an art exhibition currently showing in Denmark until the 2nd of December. 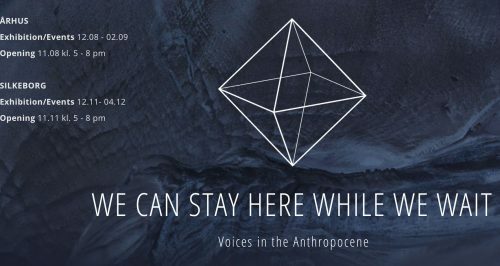 It explores how art can be part of the public debate around the Anthropocene. The exhibition invites visitors to reflect on which paths can we – and I – now choose? What new values are worth exploring? Through photographs, videos, sculptures, and symposium nights the exhibition delves into how we, humans, are temporarily on this planet and the relationships we build with each other while we are here, as well as the fragility and complexity of our relationship to the planet. The exhibition is a result of the work of four young international artists living and working together for six months at Moinho da Fonta Santa in Portugal. This artistic laboratory and residency was established by the Independent AIR, an international non-profit organization. Visit the Independent AIR webpage to learn more about We can wait here while we stay.